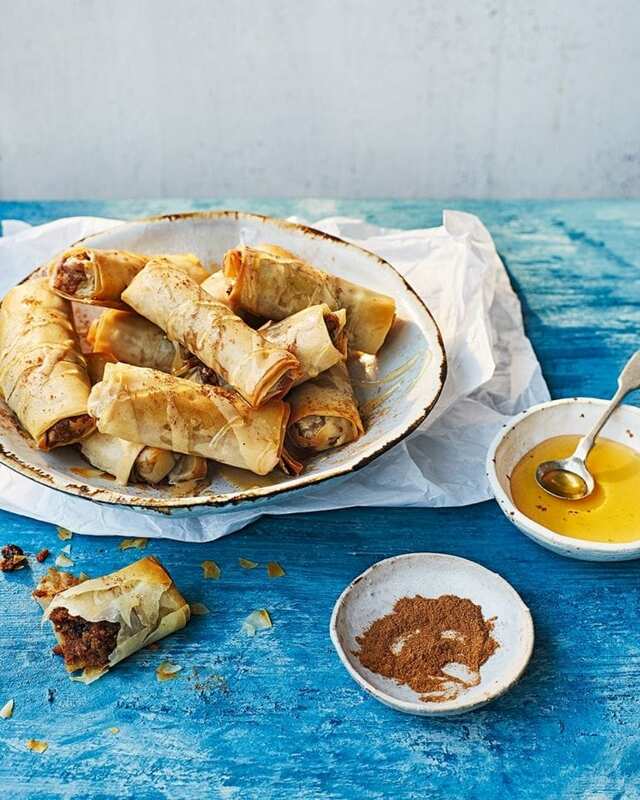 A rich and chewy mix of hazelnuts, tahini, dried fruit and honey are rolled up in filo pastry and baked until crisp. Serve with extra honey for dipping. This recipe comes from Greek cookery school, Oliveology in Borough Market. Heat the oven to 180°C/160°C fan/gas 4. Line 2 baking sheets with baking paper. Put the currants or sultanas in a large bowl with the petimezi and orange blossom water, then leave to soak for 30 minutes. Stir in the hazelnuts, tahini, honey, orange zest and juice, cinnamon and apple. With the long side facing you, cut the filo sheets vertically into 4 even strips. Keep covered under a damp tea towel. Brush one strip with a little oil. Spread a spoonful of filling onto one end of the strip, leaving a 1cm border. Fold the bottom of the sheet over the filling and roll up the pastry, tucking in the sides as you go. Transfer to a prepared baking sheet and brush with a little extra oil. Repeat with the remaining pastry strips, then bake for 15-20 minutes until golden brown. Allow to cool on the baking sheets. Pile the cigars into a bowl, drizzle with tahini, honey and a sprinkle of cinnamon. Make the hazelnut filling up to 48 hours ahead and store in an airtight container in the fridge. Petimezi is grape molasses. Drizzle it over pancakes or yogurt. Buy it at oliveology.co.uk. If you can’t find grape molasses, you can use pomegranate molasses instead.